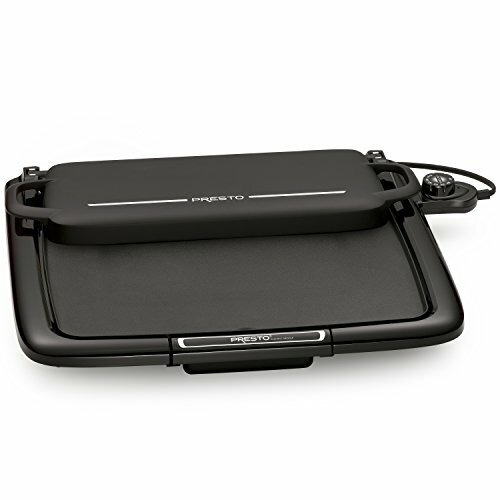 Griddle/warmer plus features an efficient "square" shape that holds more pancakes, eggs, and sandwiches than conventional rectangular griddles. The exclusive multi-function tray flips back to keep cooked foods warm and flips up for use as a spatter shield. It also swings forward to cover food for melting and steaming and removes for use as a serving tray. Great for any meal: breakfast, lunch, and dinner. Control master heat control automatically maintains the desired cooking temperature. The cool-touch base and big 14- x 15" nonstick cooking surface with built-in backstop ledge provide easy food handling and stick-free cooking. Slide-out drip tray removes for easy cleaning. Griddle is fully immersible and dishwasher safe with the heat control removed and fits in standard kitchen cabinets.